The United Kingdom is home to over 60 million people, while many British expats live in other parts of the world, most notably in Australia, Spain, the USA and Canada. 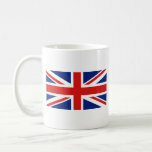 FlagAndMap products with UK designs make perfect gifts for people with a British connection. They feature the flag and map of the UK along with other motifs. The flag of the United Kingdom was adopted on Jan 1, 1801. Its design is a complex combination of red and white crosses on white and blue backgrounds representing constituent parts of the nation. The United Kingdom includes Great Britain and the northeastern part of Ireland, both islands being situated to the northwest of continental Europe. The UK map outline is easily recognized and combines well with the primary colors of the flag to create bold and iconic designs for British national mementos. FlagAndMap United Kingdom apparel includes several designs available on dozens of t-shirt styles, sweatshirts, hoodies and more. The menus below allow you to view key examples from the entire range of t-shirts with United Kingdom designs. Click on any product for full details. 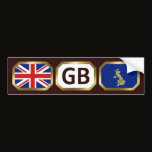 FlagAndMap offers a wide range of gift ideas for people who love the UK. Choose from mugs, bags, hats, ties, necklaces, ornaments, keychains, magnets, mousepads, bumper stickers, birthday cards, postcards, stickers and more. Typically there is a choice of product type within each product line - bags, for example, are available as budget, grocery, impulse, tiny and jumbo totes. Use the menu below to view a selection of popular products or simply link to a showcase of all FlagAndMap products with United Kingdom designs. Click on any product for full details. Information: The Wikipedia United Kingdom page is packed with information but if you're planning to visit, the Wikitravel guide for the UK will be a good resource to delve into or perhaps the Visit Britain official tourist agency site. Blogs: There's interesting reading for tourists in Louise Lambert's Snapshots of Britain and a take on the smaller details of a UK lifestyle in Vivatramp by creative writer Bee who lives in the southwest. Since we're fans of maps we just have to mention the Ordnance Survey Blog. Music: British music is so varied and globally successful that highlighting one or two musicians would be quite arbitrary. So here is an arbitrary selection of British electronica that we like - Blue Lines by Massive Attack, Big Calm by Morcheeba and Leftism by Leftfield. Copyright © 2007-2012, Flagandmap.com. All rights reserved.